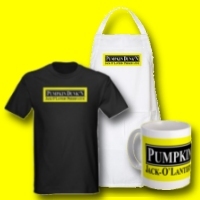 Pumpkin Dunk'N ® Jack o'Lantern Preservative will add 10 to 15 or more days (that's up to 2 weeks...!) to the life of your prized carved Jack o'Lantern masterpiece. Pumpkin Dunk'N® acts as a pickling agent to make your carved pumpkin crisp to keep it from sagging and becoming mushy. Pumpkin Dunk'N® also acts as a fungicide to retard mold and decay...! 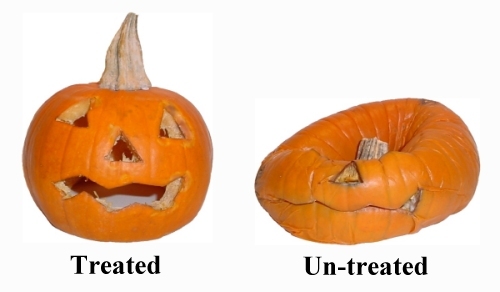 Compare the picture above with the untreated carved pumpkin after ten (10) days, and you see why you need Pumpkin Dunk'N® as a Jack o'Lantern preservative for your favorite Halloween Pumpkin Carvings. Simply dissolve a package of Pumpkin Dunk'N® in 3 gallons of clean water in a bucket or plastic tub. After you finish carving, soak your pumpkin in the pumpkin preserver solution for 24 hours. Obtain a clean five (5) gallon bucket. Fill it with three (3) gallons of clean water. This will allow an average 12" pumpkin to be immersed in the bucket without overflowing liquid onto the floor. Mix in the Pumpkin Dunk'N® per package instructions. Stir well with a wooden paddle or stick each time before use. Cut out lid in hexagonal shape. Clean out inside of your pumpkin and save the seeds. Begin carving your Halloween pumpkin masterpiece. Lid can be placed inside the carved Jack-o-lantern. All parts will then be soaking in the Pumpkin Dunk'N®. Totally immerse your carved pumpkin and lid in solution. Place brick, stone or weight on top of pumpkin. This will help to keep the pumpkin completely IMMERSED. Cover if possible to keep out dirt and debris. For best results LEAVE YOUR CARVED PUMPKIN IN THE Pumpkin Dunk'N® SOLUTION FOR 24 HOURS. Remove and dry in upside down position over the bucket. This will help drain off all the Pumpkin Dunk'N® solution. Rub off the white Pumpkin Dunk'N® powder on exterior of the carved pumpkin. You can wash it off with clean water from a garden hose, if desired. You can then polish your pumpkin gently with a clean cloth. Enjoy your completed Halloween Pumpkin Masterpiece. The contents of each package of Pumpkin Dunk'N® will make three (3) gallons of solution when mixed with water, and the same solution can be used over and over. To treat larger pumpkins, or several carved pumpkins at the same time, try mixing four (4) packages of Pumpkin Dunk'N® in twelve (12) gallons of water in a 22 gallon or larger, plastic garbage can. Note: At this time, we can only ship to addresses in the United States.